Party Everywhere! The most complete and portable DJ controller, Hercules managed squeeze the most features into this ergonomic controller. Compact yet full of features, you can even use it as a backup controller. The Hercules DJControl Compact is small enough and lightweight, it fits very easily into a bag or laptop shoulder bag. At 13,4 x 3,9" / 34 x 10 cm and weighing < 1.23 lbs / 0.56 kg you can literally take it anywhere. A 16:9th design, ideal for transporting without making concessions on the features, Hercules managed to squeeze the most into this compact design! Ergonomics that adapt perfectly to your laptop allow for concentrated Djing: all the essential functionality in an ultra-portable design. 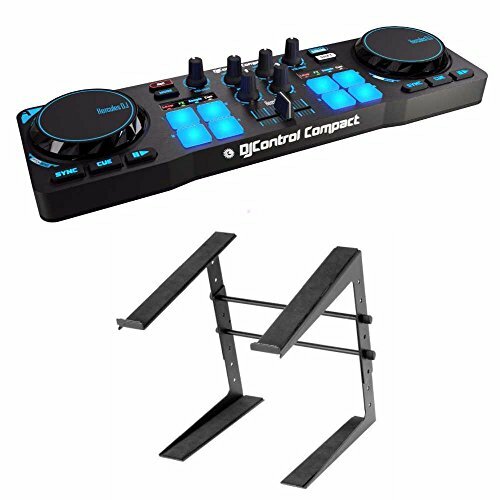 The Hercules DJControl Compact features: Dual-deck DJ controller with 2 jog wheels + 2.95" (7.5 cm), 4 modes (Loop, Fx, Samples, Cue) per deck, 4 pads per deck, 2 equalization potentiometers per deck, 1 volume potentiometer per deck, 1.77" (45 mm) crossfader AND 10 control buttons including a Shift command allowing you to double all the pad controls! Highly intuitive features to create Loops, add effects and launch samples thanks to the unrivaled feel of the pads! View More In DJ Equipment.